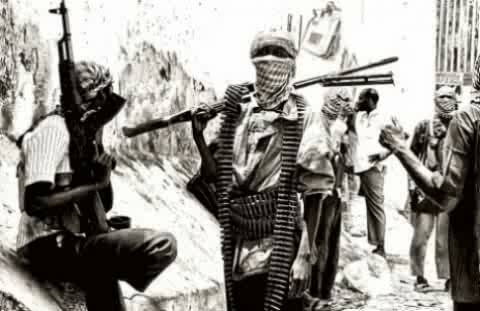 Boko Haram militants invaded Kautikari, Kwada and Nguragila villages near Chibok in Borno State, killing at least 56 people and razing numerous homes. According to SaharaReporters they learned that the militants, dressed in military camouflage, stormed the three villages from 8:45 a.m. when many Christians were at Sunday services. One source said the militants arrived in the villages in a convoy of sports utility vehicles and unleashed terror on villagers for several hours. Their killing spree reportedly lasted till 12:30 p.m.
Ibrahim Musa, a resident of Kautikari village, told our correspondent that the attackers “locked worshipers inside the EYN Church and sprayed bullets on them.” He disclosed that the terrorist group killed nine worshipers and later set the church ablaze. Mr. Musa said the Islamist terrorists killed 38 people in Kwada village and nine in Nguragila village. He added that the attackers set fire to the EYN Church, the Deeper Life Church, and the Church of Christ In Nations (COCIN). In addition, the terrorists burned numerous homes. Manaseh Allen, a Chibok-based youth leader, also confirmed today’s coordinated attacks on the three villages. “There is confusion everywhere in the Chibok area,” he said, adding, “If the attackers could succeed in day time, what if they come in the night?” He urged the federal government to redouble its commitment to combating terrorism. He remarked that the three besieged villages are between 10 and 15 kilometers from Chibok, the location where Boko Haram militants seized more than 300 schoolgirls on April 14. More than 200 of the schoolgirls are yet to be rescued. The UN Refugee Agency (UNHCR) has reported that up to 10,000 people have fled northern Iraq since ISIS began its takeover of the predominantly Christian region. Violence and gunfire in the area has prompted civilians to flee Qaraqosh as quickly as possible; most refugees bring few belongings. The UNHCR is partnering with additional charities to provide food, bedding, and hygiene kits to those forced to stay in schools and community centers. Still, the conditions are difficult for the Christians who have been forced out of their homes. “They have no access to showers and there is no air conditioning. They are living in classrooms where daytime temperatures exceed 40 degrees Celsius (104 degreed Fahrenheit),” said a UNHCR spokesperson. Some refugees need medical treatment and lack access to doctors. In total, 1.2 million Iraqis have fled the region due to violence. The UNHCR reports that $64.2 million is needed to assist the influx of refugees; so far, they have only raised 8 percent. The announcement from the UNHCR came on June 20, the same day that Human Rights Watch reported ISIS insurgents had killed at least 160 Iraqi men in a mass execution. Hitting “like” on Facebook has landed a Christian man in Egypt in jail for six years. Kerolos Shawky was sentenced Tuesday to six years in prison and fined the equivalent of $840 on charges of blasphemy and contempt of Islam for simply “liking” the Facebook page ‘Knights of the Cross’, according to International Christian Concern (ICC). Rafla Zekry Rafla, a lawyer representing Kerolos, said it was not Shawky’s intention to insult Islam. Rafla says Shawky didn’t have much experience with the Internet and also suffers from poor eyesight. He never had any intention of committing contempt, or even blasphemy. Kerolos was convicted by the Egyptian court of violating Article 98(f) of the Egyptian Penal Code, which prohibits “ridiculing, or insulting heavenly religions or inciting sectarian strife.” Ironically, it was the public accusations against Kerolos which actually incited local violence as Christian shops and homes were vandalized and set afire. His defense team plans to appeal and hopes the conviction will be reviewed before the end of this month, one of his lawyers told ICC. Kerolos’ case and the attacks on Christian-owned property demonstrate the high level of sectarian tensions that continue to be present, said Jay Roddy, researcher with the Tahrir Institute for Middle East Policy. “Shortly before the man’s trial was set to take place, Christian-owned property in the same village was set ablaze in what appears to be a related attack,” Roddy told ICC. This is now the third conviction of a Christian on what should be insignificant charges.